The State and Regional Employment report for June, released today by the Bureau of Labor Statistics, shows continues jobs gains in most states, with six only experiencing job losses. In 40 states and the District of Columbia, the unemployment rate either decreased or remained the same. From March to June, 44 states added jobs, with North Dakota (1.4 percent), Massachusetts (1.0 percent), North Carolina (1.0 percent), New Hampshire (0.9 percent), and Texas (0.9 percent) having the highest percent change in job growth. Similar to last month’s report, North Dakota had the largest percent growth of jobs. 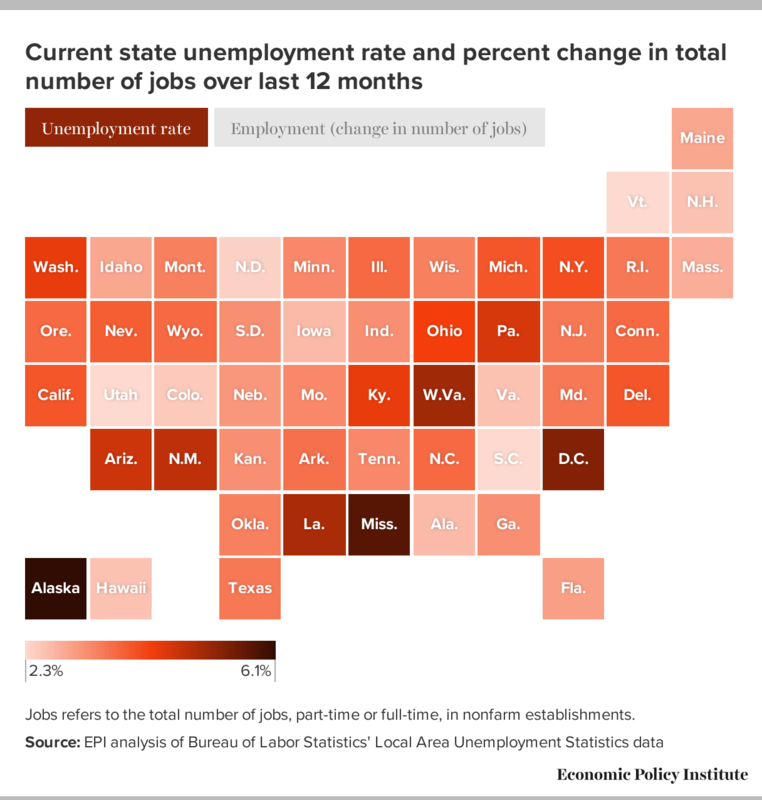 Over the last three months, the number of jobs fell in six states: Alaska (-0.6 percent), Indiana (-0.2 percent), Kentucky (-0.2 percent), and Maryland (-0.1 percent). In New Jersey, West Virginia, and the District of Columbia, the number of jobs was essentially unchanged. From March to June, unemployment rates fell in 29 states. New Mexico (-0.7 percentage points), South Carolina (-0.6 percentage points), Pennsylvania (-0.5 percentage points), Delaware (-0.4 percentage points), and Georgia (-0.3 percentage points) saw the largest declines in unemployment rates. The unemployment rate increased in 10 states. The largest increases in unemployment rates occurred in Alabama (0.3 percentage points), Louisiana (0.3 percentage points), Kentucky (0.2 percentage points), and Maine (0.2 percentage points).